Salvation And Survival: IMPORTANT INFO! Smart Meters Are Coming To Your Neighborhood! IMPORTANT INFO! Smart Meters Are Coming To Your Neighborhood! For awhile now, I have been concerned about the installation of "Smart Meters". What are they? One of the best explanations I've seen was on the website, earthcalm.com, a site that monitors the dangers from electronic and magnetic fields. Their definition reads: "Smart Meters are electric and gas meter reading devices being installed all over the US as a first step in creating a national smart grid. Designed to enhance energy efficiency and make widespread adoption of renewable energy easier, Smart Meters are radio transmitters that communicate data from homes and businesses to the gas and electric company through a matrix of radio signals. They allow people [and eventually, the government] to measure and monitor their own energy consumption in order to reduce it." In other words, we are supposed to hale the advent of these new devices as a way to monitor and reduce our energy costs, while saving the planet. You want the truth? They are part of the U.N.'s "sustainable development" and Agenda 21 plan of action. The installation of these meters is being mandated across the nation by the federal government, and stimulus money is providing the funding. However, one finds out that the law asking for smart meters and a smart grid, (Energy Policy Act of 2005), only mandates the utilities to "offer" the meters and to install them "upon customer request.” The choice is still supposed to be ours. However, what I am about to tell you will show that we are being offered no choice at all! In case you think I am just responding to my normal conspiracy bias, let me tell you what I encountered just yesterday. I noticed the Grid One company truck entering my property and the meter reader approaching my utility pole. I met him at the pole and asked why they were no longer reading the meter from the highway. The utility representative could barely speak English (that's another issue I could speak to! ), and was only able to tell me that "Next year, everyone will get Smart Meters." I tried to question him further, but he had no answers. Now my radar was up! I went to the internet and started doing my research, and I was astonished to find that citizen activists all over the nation are fighting the forced installation of these so-called "smart growth" energy devices. There are areas of the country that are under assault; their rights are being violated as older analog meters are removed and they are forced to accept the new Smart Meters. With a smart meter on your home or property, your kilowatt hours will be billed at different rates during different times of the day. Mary Hendry, of Lakeland, FL wrote in an article, "“Basically, you can't cook, bathe, run the washer or dryer, have heat or air conditioning until after 9 at night, or you are spending too much on electricity. If a mom is trying to keep the electric bill down, I see her bedtime being around 2 a.m. most nights.” She explains that with her utility company, the three main time categories are on-peak, mid-peak and off-peak.... and peak time is almost twice as expensive as off-peak." And what we're not being told is the harm to our health from these "smart" devices. Hendry's article goes on to tell us, "There are already hundreds of thousands of cases against various utility companies because of the deleterious health effects of smart meters. The symptoms and illnesses range from nausea, vomiting and tinnitus to heart arrhythmia and cancer due to the radio frequency waves and electromagnetic frequency they emit. In fact, studies done on the same kind of waves emitted by smart meters show them to be equal to a level two carcinogenic." And earthcalm.com has a very informative article stating all their research on the health risks of the smart meters. Citizens across the country are rightfully concerned and up in arms over this violation to our Constitutional rights. In one case, in Houston, TX, a citizen literally had to protect herself from a Utility Company enforcer. 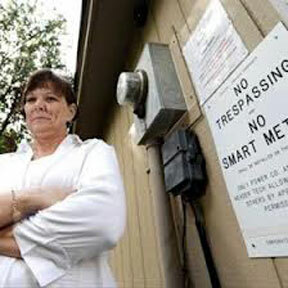 Thelma Taormina was home the day the utility company tried to install a smart meter. An article at newamerican.com describes the encounter experienced by the 912 Project activist. When the public-utility subcontractor showed up to install the meter, Thelma informed him she didn't want it; that he was trespassing on her property, and she asked him to leave. He refused. Words were exchanged. He called his supervisor; she called her husband. He was asked to leave several more times; he continued to refuse and to install the meter. Their encounter escalated and the subcontractor shoved her. She put her hand on the meter to stop him, and more shoving ensued. He threatened to call the police, and then suggested she do it, because he would be through installing the device by the time they arrived. She had enough. She felt threatened by his physical actions, and he refused to leave her property when asked. So being a Concealed Carry Permit holder, she gained access to her gun and asked him to leave again. This time he complied. This story has made national headlines, and according to Thelma, been sensationalized by all the Second Amendment haters. The subcontractor did call the police in the hopes of filing assault charges. They came, questioned Thelma, and determined that no charges would be filed. The man was trespassing and did not leave when requested. So for the time being, Thelma is through with the incident. (Some personal advice? Next time, Thelma, you should be the first one to call the police. You were the victim, and by delaying, you made the utility employee look like the victim.) So while Thelma still does not have a smart meter, the Public Utility is still considering the pursuit of legal action..... some nonsense about being "troubled that someone would pull a gun on an employee trying to do their job." Although Thelma was successful in resisting the installation of her Smart Meter, over 2,000,000 have been installed in the Houston area.... even though Texas state law does not mandate the meters. So my question to you is this: Do you know where your public utility stands on this issue? What are your state laws? Do you know the steps to resist the installation should you decide to opt out? Do your research! This is not just happening in Texas or Florida or California. It is nationwide! Don't fall for the propaganda. This is more than the advancement of technology; it is Big Brother and the U.N. controlling how we live our lives. Be informed and take your stand! Colossians 1:28-29 "Him we preach and proclaim, warning and admonishing everyone and instructing everyone in all wisdom, that we may present every person mature in Christ. For this I labor, striving with all the superhuman energy which He so mightily enkindles and works within me." I live in California unfortunately. As I'm sure you know California is the leader in Agenda 21. I tried to fight the installation of the smart meter to no avail. I was home when they came to install the meter the first time. I told the man that I'm opting out of the program. He told me I had no choice because of where I lived. I live in a remote mountain community. This man was actually pretty understanding but he had a job to do. He postponed the installation that day. I was informed that they would be in the area until all meters were installed meaning you aren't here all the time. In my area the meters are situated by the dirt road so there is easy access without trespassing. Sure enough I came home from work and there was the smart meter. Those of us living in the country are now being forced to pay an additional $150.00 "fee" per defensible structure for firefighting. It can't be called a tax because the voters didn't approve it. This money doesn't even go to the firefighters. Lord deliver me from California. 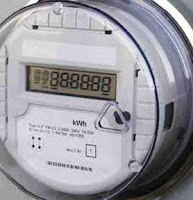 What does your California law say about mandating the smart meters? Can you fight it that way? This is what Obama meant when he said "energy bills will necessarily skyrocket". All the expenses and fees that go along with Agenda 21 will be passed on to the consumer. We here in Texas have a legislature that seems to be listening to our concerns, but we'll see. I know that Californians seem to be fighting a losing battle. When you've reached your limit and if you're willing to fight for the Constitution, we'd love to have you in Texas! I wanted to share this website with those who would like to know more about these smart meters and what they can do and shouldn't do. There is actually quite a bit of info out there and I can tell you it ISN'T positive. This is just my two cents of looking a little closer into this. It's a very interesting, eye opening site and maybe if we all look into this and do something now, we can put a stop to it. There is a site in Michigan that they are actually asking people to sign a petition to bring this to a halt. From what I'm reading, it's goes against our 2nd and 4th amendement. I would suggest that people in other states do the same. Make our voices heard and let those who wish us harm and has the knowledge that it does, have to hear that "squeaky wheel". Ignorance IS NOT bliss! Help educate your family, friends, church members and neighbors and bring it to the attention of our township and city officials. Send out an email to everyone you know and give them this information and have them do some serious checking and investigating on this. I praise the woman in your article who took a stand with the company who didn't want to take "no" for an answer. Good for her! Lisa, do you have the website in Michigan? As much information as we can get out to people will help them be prepared to deal with this. I agree, it is not going to be easy, and you will have to decide how far you're willing to go before giving in to the Agenda 21 system. I'm sorry that I failed to add the website to my comment. I tried three different times last night to add it, but my comment kept disappearing so I gave up until this morning. Hopefully this will go through. Anyway, the site for the Michigan petition is www.change.org. I just went to the search engine and put in "Michigan smart meters petition" and this site came up so you can sign your name to that petition. Hopefully, if people in other states would do this, maybe there will be a petition to sign for their state, if not, maybe they could start one and start sending it around through their emails to get one rolling. I have to tell you, putting in the search engine...(smart meters) was very enlighting and there was NOTHING good about these things. It is downright scary, honestly. The other site that I would like for others to know about is....http:stopsmartmeters.org. This site is an excellent source and I would suggest to read it very closely to see what others have done and how they went about doing it. There is definitely a way to go about it and what to do and NOT to do. I plan on sending a registered mail letter to our electric company and telling them I am OPTING out and do not want any smart meters placed on my property for health reasons. That way, I'll know that it went to the right people, someone signed for it and I have record of it. There was mention to NOT call your electric company, because it puts you on a list. I suggest that those that go to the latter website that I mentioned, please read all the comments below that article and share this website with others so they can be informed. There is a ton of information on this and people need to be aware how they are going about implementing it. The government and these power companies are very sneaky. I truly believe that if more people will move on this, we can put a stop to it. If we enjoy our health at all, we better pay attention to this because this is something that can certainly bring ill effects to our health and lives. You know me, makes me think there is more to this than what is on the surface....like population control?! It upsets me to think that the people who invented this, the government and these companies know darn well what health ramifications that is causes, but yet they still do it. Not only is it our health, there are other safety factors with these and also the huge intrusion into our privacy. Just one more freedom taken from us, but, only if we allow it. They just keep picking away and doing it ever so quietly. I again suggest that others that read up on this, send the information on to their families, friends, neighbors and church members and anyone who would listen to their concerns in their townships and cities. If we don't move on this, we're all going to pay a heavy price other than the expense of these and there is a lot to lose.